Dealing with a roof leak can be tricky. 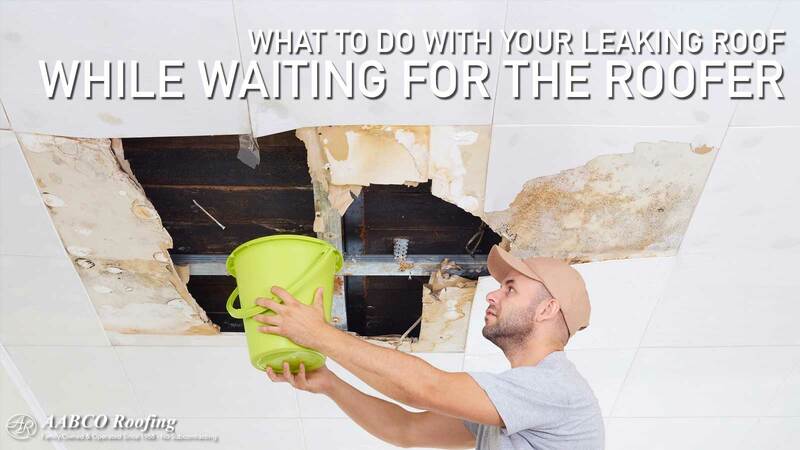 Leaks can cause havoc in no time at all, even while you’re waiting for your roof repair specialist to arrive. There are some handy quick steps that you can take to temporarily fix your leaking roof and avoid any potential damage. Let’s have a look at each of these steps. Make sure you don’t panic. Just take one thing at a time. It’s really important to help minimize any interior damage that the roof leak may cause. Be sure to get some buckets to help catch the water and then locate the leak. You can do this by checking if the ceiling boards are absorbing moisture, or by looking for drips coming from the ceiling. You want to ensure that water is not accumulating above the ceiling boards as the weight of this water could cause your ceiling to collapse. If you can see a small dripping area, you may need to create a small hole to allow the water to drain out. Make sure you put a bucket underneath to catch the water. The next thing you need to do is to locate the source of the leak. Remember to always check in your attic for the leak if you have one. Tarps can be a very handy material to temporarily keep the water out. Once you have found the leak, if it’s in your attic, you will need to secure a tarp over the area by either tying it down or installing nailer boards such as 1×2’s to prevent it from flying off. Make sure that the ends of tarp extend over the ridge of your roof to increase the tarps ability to retain water. If one layer isn’t enough, you may need to consider installing a second tarp a few inches below the first one. If you don’t Be aware – this is only a very temporary solution and every caution should be taken when putting up the tarp. A tube of plastic roofing cement is always handy to have around for emergencies such as a leaking roof. Plastic roofing cement is designed to seal holes in roofs and it gets to work quickly. You’ll need to make sure that you have the correct tools to apply the roofing cement. Make sure you have a roofing trowel, or putty knife in order to apply the cement. You also want to make sure that you apply enough of the cement to adequately cover the hole. Another quick solution is to stick some roof tape onto the leak.Roofing tape is widely available and should be applied to the inside of your roofing material. Roofing tape can be quickly applied by just tearing off some pieces of tape and patching them over the leak. Again, this is a temporary fix and you’ll need to keep an eye on its hold just in case you need to apply more tape. If your roof leak is visible because of a missing tile or shingle, then an easy solution is to get a can of high-grade roofing mastic to apply over the leak. Mastic or Roofing Cement can be applied over the leak to temporarily stop the water from coming in. You’ll need to push the mastic into any holes or cracks that are present to ensure that it seals well. Also make sure to spread it a couple of inches around the area to prevent any further leaks. At the end of the day, these are all just temporary fixes. The first thing you want to do when you suspect a leak, is to ensure that you have made contact with a reputable roofing contractor who can repair the roof leak properly. At AABCO Roofing, we offer prompt and professional service with high quality workmanship. All it takes is one call for peace of mind.